Amaze yourself with how your flowers, plants, trees and vegetables can thrive by using a Green Thumb to energize your watering! Just leave the tube in any one gallon container of water for between four and eight hours, and pour the water on your plants - no chemicals, no hormones. The results from using the Green Thumb are astonishing. Sick plants come to life and the growth rate is stimulated. 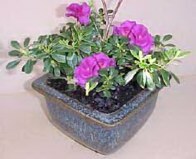 Plants become healthy and vigorous. Particularly good for those who need a "green thumb". Every day for many years, this unit will make 3 to 6 gallons of ionized water. Drop tube into a one gallon container of water overnight. Make sure you leave the tube as is. 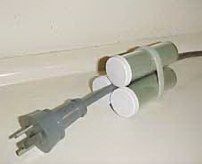 The contents of the tube are meant to be encased within the plastic housing. Do NOT use on rubber or succulent plants due to the negative polarity of these species. If you want to give some special plants an extra boost, you can partly bury a Green Thumb in the soil close by. The plants seem to assimilate water and nutrients much better and so grow tremendously well. A few vineyards have planted Green Thumbs by their vines to gain an advantage with the quality of their plants and fruit. As the energy attracted to all the products is the same life-force energy, the Green Thumbs can be used to help the individual as well as plants. 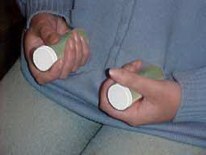 Just hold one or two thumbs for twenty minutes a day to reenergize your body system. Cancer patients undergoing chemo or radio therapies have reported that they are better able to cope with the cancer treatments when using the green thumbs, as their bodily reserves of energy are renewed more quickly. Another use of the Green Thumbs is to attach three to any power cord of any appliance to treat the electromagnetic frequencies emanated by all our gadgets. Treating one appliance appears to treat anything plugged into the same circuit. Specific biofeedback machines will show that the leakage does not actually affect your body in the same way as before application of Green Thumbs. The stress levels in your meridians and organs will be much less.